Karpathos Island, Dodecannese Islands, Cafe, Bar, Club, Bistro, Taverna, Restaurant in Greece. Karpathos is located between Rhodos and Crete and belongs to the Dodecanese, which means "the twelve". In addition to the capital Karpathos (formerly called Pigadia) there are about ten main villages with approximately 5.000 people in total. Many of the Karpathiens have immigrated to the USA and Australia for economic reasons. Most of them use to work hard, but they come back regularily for elections, vacation or family celebrations. The situation leads to an increasing contrast between lively traditons and Americanism, forming the face of Karpathos' society today. Karpathos is a long and narrow island with many different faces. The southern part of the island is low with gentle hills and sandy beaches. The byzantine city of Thaetho, was situated here, at the area where the airport is today. Of the city only extensive sherds and demolished edifices are still to be traced today. The middle southern part of the island, is marked with low stony mountains, valleys dedicated to agriculture, and long sandy beaches. The capital of Karpathos, the town of Karpathos or Pigadia, is situated on this part of the island, on the site of the ancient greek city of Karpathos. 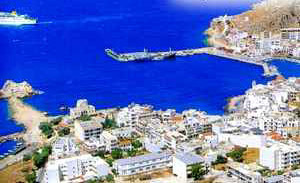 Another seven villages, Menetes, Arkasa, Phoeniki, Pyles, Othos Volada and Aperi, belong to this part of the island, which the Karpathiotes call Kato Horia (lower villages). Aperi was the old capital of Karpathos, and is still the seat of the archbishop. Above the village on the top of the commanding hill of Kastro, there are the remains of medieval fortifications. A nice path to walk up the hill, begins at the village of Volada (30min). From Volada you can also set off to conquer the island's highest peak (1215m), which bears the unusual for a mountain name of Kalolimni, meaning "Good Lake". Take the road to Othos, and before reaching the village, take the turn to the right (north), towards the plateau of Lastos. It is said that Lastos was in prehistoric times a lake, formed by the water from the springs of Kalolimni. In recored history times, Lastos has been producing excellent wine. There are still a few farmers' cottages in the platau, the "stavli" where the Karpathiotes resided during the harvest. The road continues from Lastos up the mountain to a camp of relay transmitters' installations. You can either follow the road or trace and follow goat paths. You will have reached the peak in 4 hours. Menetes and Othos were built after the destruction by the pirates of the byzantine city of Thaetho, by the city's remaining inhabitants. Arkasa and Phoeniki, lay at the area of the ancient greek city of Arkesea. 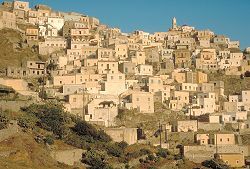 The villages were built only as recently as the the end of last century. As it has been common practice, the builders used material of the ancient Arkesea to built their houses. The big church of Menetes was also built with ancient stones capitals and columns, which were carried on donkeys from Arkesia up to Menetes. The builders seem to have been too eager to carry the ancient material, so that 4 columns remained unused, standing now out side the church! All the cottages of the area were also built with ancient material, but the long story of "the city for the taking" does not stop here. Every traveller in the past several senturies has to record a diminuition. 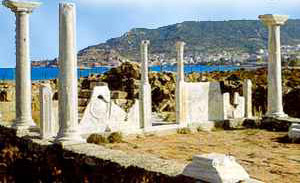 Ludwig Ross, the Austrian archeologist who visited and described the site in 1836, speaks of the removal of 20 pillars to Samos island, for the building of the monastery of Stavros, and of a project to remove more material to the island of Kasos. Manolakakis, in his book "Karpathiaka", records the execution of this plan. The area of Arkesea is mostly turned into fields today. The chapel of Agia Sophia marks the site of three early byzantine basilicas of large proportions (20x15m), built successively on one another, and each level having mosaic floors. Unfortunately the long story of "diminuition" of the ancient Arkesea continues today with the destruction of the fragile mosaics of the basilicas. The ancient acropolis of Arkesea occupies the prominent peninsula projecting out of the sea. There are cyclopean walls and ancient greek walls, and foundations of public buildings, probably temples. Follow up the path from Agia Sophia. The middle northern part of Karpathos is dominated by the island's highest mountain range, Mount Kalolimni. There are two vilages here, Mesohori and Spoa, with their sea side fishing-hamlet of Lefkos, situated at the site of another byzantine city, of considerable size. The basilica excavated in the mid '70s at Lefkos's anchorage was of unusual size, being 60m long.